(Nanowerk Spotlight) We have written about scientists' fascination with graphene - the flat one-atom thick sheet of carbon - before ("Nanotechnology researchers go ballistic over graphene"). Over the past couple of years, graphene has become a new model system for condensed-matter physics - the branch of physics that deals with the physical properties of solid materials - because it enables table-top experimental tests of quantum relativistic phenomena, some of which are unobservable in high-energy physics. The behavior of electrons in graphene is very different from their behavior in typical semiconductors. In the latter, they possess a mass, and a finite energy (called the energy gap) is necessary to move the electrons from the valence to the conductance band and they move like regular particles, increasing their speed as they get accelerated. In graphene, electrons move with a constant speed - much faster than electrons in other semiconductors - independent of their kinetic energy (similar to the behavior of photons), and there is no energy gap. Graphene, which basically is an unrolled, planar form of a carbon nanotube therefore has become an extremely interesting candidate material for nanoscale electronics. Researchers in the UK have now, for the first time, shown that it is possible to carve out nanoscale transistors from a single graphene crystal. Unlike all other known materials, graphene remains highly stable and conductive even when it is cut into devices one nanometer wide. "Our recent work demonstrates electron transport in quantum dot devices carved entirely from graphene" Dr. Kostya Novoselov tells Nanowerk. "At large sizes (>100 nanometers), they behave as conventional single-electron transistors, exhibiting periodic Coulomb blockade peaks. For quantum dots smaller than 100 nanometers, the peaks become strongly nonperiodic, indicating a major contribution of quantum confinement." Novoselov, The Royal Society Research Fellow, and a member of the Mesoscopic Physics Group at the University of Manchester, is one of the original team, led by Professor Andre Geim, that discovered graphene in 2004. In a recent progress article in Science ("Chaotic Dirac Billiard in Graphene Quantum Dots") Novoselov and Geim show that graphene can be carved into tiny electronic circuits with individual transistors having a size not much larger than that of a molecule. The University of Manchester group has developed an approach that lets them reliably fabricate graphene quantum dots with features as small as 10 nanometers. 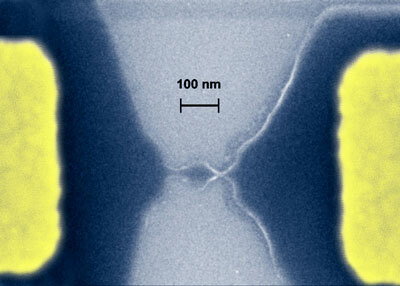 They found three basic operational regimes for these quantum dots, depending on their size. Devices larger than 100 nm exhibit nearly periodic Coulomb blockade resonances. "In general, the behavior we observed is in agreement with the one exhibited by conventional single-electron transistors (SET)" says Novoselov. " The all-graphene SETs we fabricated are technologically simple, reliable, and robust and can operate well above liquid-helium temperatures, making them attractive candidates for use in various charge-detector schemes." For devices smaller than 100 nm, the scientists observed a qualitative change in behavior: Coulomb blockade peaks were no longer a periodic function of the back-gate voltage but varied strongly in their spacing. "This is a clear indication that the size quantization becomes an important factor even for such a modest confinement" says Novoselov. He notes that for even smaller devices (<30nm), the experimental behavior is completely dominated by quantum confinement. "However, because even the state-of-the-art lithography does not allow one to control features <10 nm in size, the experimental behavior varies widely. Some of the devices become overetched and stop conducting, but in other cases we have narrowed them down to a few nanometers so that they exhibit the transistor action even at room temperature." Unlike any other material, graphene remains mechanically and chemically stable and highly conductive at the scale of a few benzene rings, which makes it uniquely suitable for the top-down approach to molecular-scale electronics. "Previously, researchers tried to use large molecules as individual transistors to create a new kind of electronic circuits. It is like a bit of chemistry added to computer engineering," says Novoselov. "Now one can think of designer molecules acting as transistors connected into designer computer architecture on the basis of the same material – graphene – and use the same fabrication approach that is currently used by the semiconductor industry". "It is too early to promise graphene supercomputers," adds Geim. "In our work, we relied on chance when making such small transistors. Unfortunately, no existing technology allows cutting materials with true nanometer precision. But this is exactly the same challenge that every post-silicon electronics has to face. At least we now have a material that can meet such a challenge."